Texting a message is one of the quick and simple way to communicate with others in this fast-moving society. So it is obvious that text messages have taken more and more storage space in your iPhone, because in some specific situations, you may prefer texting messages than making calls to others due to various reasons. Therefore, texts on your iPhone could be one of the most valuable data on your device because it always contains lots of important information from your clients, boss, honey, family and more. Among these messages, some of them you may wish to save them on your iPhone for reviewing anytime you want, but things are not always perfect as you imagine. 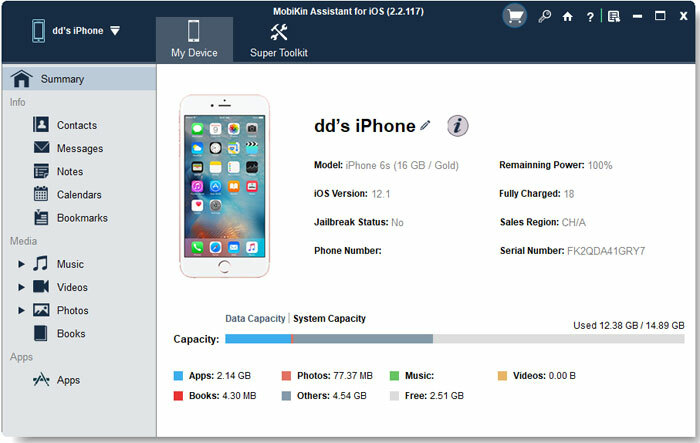 But more often than not, bad things happen to iPhone data, like a mistaken deletion, accidental loss, virus attack, system broken and even worse iPhone lost. Or when your iPhone messages box is filled with SMS, and you can't receive new messages, then you want to delete some of them to free up space for the limited storage space. but you may have some messages which reminded you lot of previous unforgettable memories and you never wish to lose, right? Therefore, it is necessary to copy text messages from iPhone to computer for backup beforehand. However, the problem is coming: As we well know, iTunes is a one-way transfer tool, how can we achieve this transferring work in a simple way? Luckily, the answer is yes. 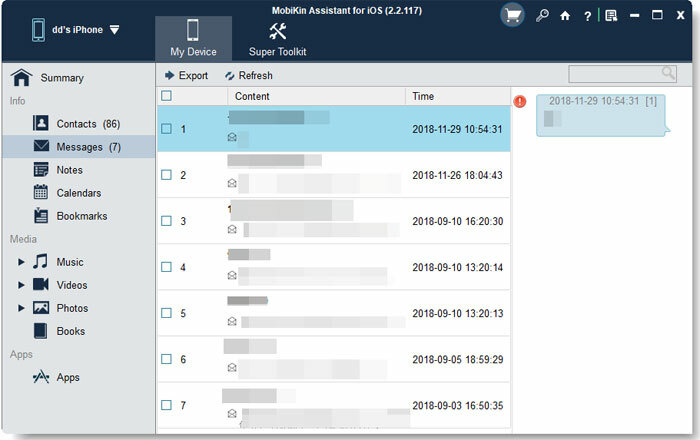 Here comes a professional transfer tool: MobiKin Assistant for iOS (Win/Mac). It is well designed for iPhone users to transfer or copy text messages from iPhone X, iPhone 8/8 Plus, iPhone 7/7 Plus, iPhne 6S/6S Plus, iPhone 6/6 Plus, iPhone 5S/5C/5, etc. to PC swiftly. In addition, other iOS devices like iPad Air, the new iPad, iPad 2, iPod touch, iPod nano, etc. are also supported by this program. Now, let's turn to our business - Get the free trial version of the powerful iPhone Message Transfer program, and then follow the below instructions to see how easy to use the program to transfer text messages from iPhone to PC or Mac. Tutorial: How to Transfer Text Messages from iPhone to Computer/Mac? Note: iTunes is required to be installed on your desktop computer before, but it is no need for you to launch it. The software will display all iPhone files in categories on the left panel. Choose the "Messages" category and preview all the iPhone conversation in the program. Meanwhile, you can pick up the ones you want to backup. Finally, you can directly click the "Export" button to select an output format as you like, then begin the transferring process at once. Please be noted that there are four different formats for your reference, including HTML, Text, CSV and DB.